I'm also enjoying this and am prompted by your message to add a little more. Thinking about memories and the kind of double exposure you're talking about (40s songs with all those associations heard in the 50s) makes me think of the now multilayered experience of hearing groups today: songs predating their youth, sung in their youth, now sung in the dignity/poignancy/slow decay (select according to today's mood) of late middle age. The other experience is seeing the Spaniels in London 1992. I’m of Irish descent and can't remember when I first heard Danny Boy but have always loved the directness of that song. Pookie Hudson introduced it as a song they sang in the locker room at High School in 1952 (or whenever). Great acapella rendition, true both to the Spaniels' style and the song - not all the acts that night sang like it still meant something - and for me something incredibly moving that 40 years on, there they were - or the same nucleus, anyway - and it couldn't be the same, could it? Not 15 any more. But it still felt real and vital and connected: "That which we are we are,' as the aging Ulysses says. I think I'm done. I hope readers other than yourself will be indulgent and realise this comes out of the great love we all share for this timeless music. As mentioned in Post 10 of this series, that 1992 concert was not well attended. And I was sitting needlessly way, way back in the first half, which didn't help. But my impression was that it was only Bobby Lewis who was warming up the crowd, albeit by relying on Big Joe Turner covers in order to save his big hit till the end. Johnnie Allan either didn't connect with the crowd or wasn't given time. But the Spaniels were a class act from the git-go, intimidating as Gerald may have looked with the eyepatch. They came on to Baby It's You (of course), which took me back to my Springboard International album, which featured the remake of Baby It's You as well as Golden Teardrops. Whatever, it worked; and I was aware that, as others have said, Pookie is not a showman as some are, but he does - or, as I must now say, did - the most important thing of all: singing as though he is still feeling and exploring the song right at that moment. Which goes all the way back to that tentative definition I offered in Post 1 of this dialog[ue]. Download former XM deejay Matt the Cat's interview with Pookie Hudson here; you can also find interviews with other doo wop and R&B greats. The interview is well worth a listen; Matt is an intelligent, informed, as well as an enthusiastic, host; Pookie is gracious; callers mostly pay tribute. I didn't realise that he had been getting at least some payment for Goodnight, Sweetheart, Goodnight since 1978, and that laws had changed at some point so that performers on a recording now get something, no matter how miniscule, each time a recording is aired. Appropriate enough when you think of how much the performance is part of a record's success (apparently Richard Rodgers hated the Marcels' recording of Blue Moon, although I don't know whether he spurned the resulting royalties). Matt also made the point that small record companies were often up against it in terms of when they would be paid by distributors, so that delayed (or no) monies could be about a little indie struggling for survival - to which, I admit, one obvious riposte might be: "Tell it to Carl Perkins." Anyway, I don't know whether such thoughts were a factor, but the Spaniels' biography does record that Pookie, for his own sake, made it up with Vee Jay's Vivian Carter before she died. 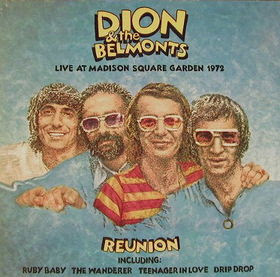 To return to that concert: a Dionless Belmonts also performed, although they seemed to be doing a lot of Dion solo numbers, on the grounds that they had performed them during that reunion gig noted above. They were agreeable enough, although I don't remember the performance in detail, apart from the disturbing fact that one Belmont was now stone bald: suddenly it ain't the fifties no more. The Spaniels were the best act of the evening but the headliners were the Teenagers with Lewis Lymon in their number. I can't remember whether the female lead was Pearl McKinnon or a later replacement, but I do remember the brightness of delivery becoming a little tiring by the end, and the oddness of the references to the departed Frankie: his mischievousness was mentioned, not his death. To which the response might reasonably be: Well, what did you expect them to do? And from what I've read of the Teenagers, they deserved to make some money and I hope they did; it was a polished act which delivered what the audience wanted. 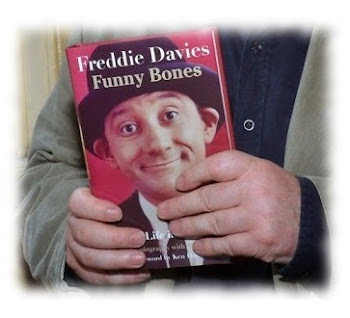 But what it comes down to, I suppose, is that a Teenagers without Frankie is like - well, a Spaniels without Pookie.